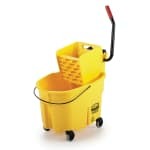 The Rubbermaid FG758088YEL WaveBrake® mopping combo unit has a 35-quart capacity. Its baffles reduce splashing in the mop bucket, and its wringer lasts 200,000 cycles. This wringer can be removed with a center pull handle, and integrated guides ensure it is securely connected to the mop bucket to prevent spills. A pour spout controls flow from the bucket, and the ledge hooks onto a sink to add balance when draining water. You can find out more about units like this from the article on mop buckets.